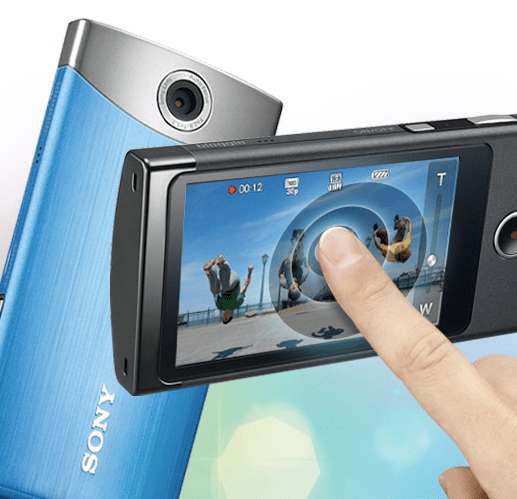 Sony welcomes you to the world of digital video recording with their MHS-TS10 Bloggie Touch HD Camera. On a recent trip we tested out the Sony Bloggie Touch HD Camera. We were most impressed with how compact, yet easy the video and still camera was to use, making it a pleasure to capture those memorable moments. The Bloggie offers 4 GB of built-in storage capacity for up to two full hours of HD video. With lower quality video and still pictures that storage space translates into even more opportunities. One of the best features of the camera was being easily able to share the video experiences with friends or family by uploading files that are already optimized for Internet use. In fact, the Sony Bloggie is so easy to use that it makes you want to take it everywhere. The Bloggie features a 3-inch touch sensitive screen, digital 4X zoom, autofocus, face detection, auto image rotation, and freestyle recording capability. The camera’s Exmor™ CMOS technology provides crystal-clear video recording at 1920 x 1080 HD resolution, and equally stunning still pictures at 12.8 mega-pixels. Even when lighting conditions are not optimal the Bloggie is smart enough to compensate accordingly, but it does best while outside. The camera features a built-in USB arm, which connects easily and seamlessly to any Mac or PC. And if you want to view your content on HDTV, there’s also an HDMI output that makes that possible as well. The camera comes in some great colors including black, silver, blue and pink. All and all this is a perfect camera for capturing video while traveling. The video comes out so clearly for such a small device, that it can quickly become addicting to start filming everything. Although it does take photos, we prefer this camera specifically for its video taking ability. The camera starts at $179 on the Sony Store website.